The fifth-ranked Nebraska volleyball team got back on the winning track with a 3-0 (25-13, 30-28, 25-11) win over Indiana in front of 8,243 fans on Wednesday night at the Bob Devaney Sports Center. 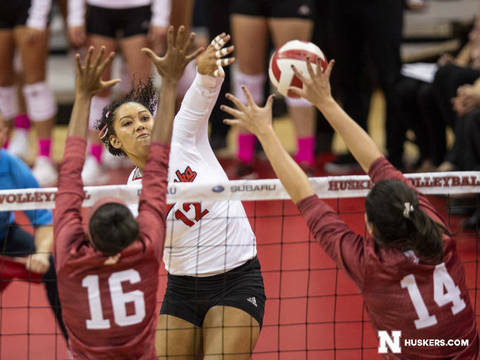 The Huskers (15-2, 6-1 Big Ten) rebounded from their first Big Ten loss of the season to Minnesota on Saturday by stifling Indiana to .094 hitting in the match. Lexi Sun had 11 kills, nine digs and four blocks, and Jazz Sweet had 11 kills while hitting .435 with five blocks. Mikaela Foecke added 10 kills and nine digs. Nebraska served seven aces on the night, including a career-high-tying four by Kenzie Maloney, who also had a match-high 11 digs. Sun had a pair of aces, and Nicklin Hames had one to go with her 31 assists and 10 digs. The Huskers had a .301 hitting percentage for the match but were particularly sharp in the third and final set with a .593 clip. Nebraska had a big edge in blocks, 11-6. Callie Schwarzenbach led the way with nine, matching her season-high in a three-set match. Indiana (11-7, 2-5 Big Ten) got seven kills each from Deyshia Lofton and Hayden Huybers. Kamryn Malloy had six kills. Set 1: Nebraska cruised in the first set to a 25-13 win. The Huskers had three service aces and eight kills by five different players, led by Sun’s three. NU led 11-6 before going on a 9-0 run to take a 20-6 lead. Nebraska held Indiana to .037 hitting in the set. Set 2: Nebraska turned a 4-3 lead into an 11-5 lead with a 7-2 spurt, sparked by a Maloney ace and a block and a kill by Sun. The Huskers doubled up the Hoosiers, 16-8, after three blocks which Schwarzenbach was in on, two with Sweet and one with Sun. The Hoosiers got within 18-15 after a 6-1 run, and they then tied the set at 20-20 after four consecutive points to make the run 11-3. The teams traded sideouts for the next 10 rallies to a 25-25 tie. An ace serve by Indiana gave the Hoosiers set point at 26-25, but Sun terminated an out-of-system ball to tie the set at 26-26. A block by Hames then gave Nebraska set point at 27-26, but Indiana kept the set going with a kill by Malloy. A solo block by Malloy on the next rally made it 28-27 Hoosiers, but Sun answered with a clutch kill once again to level the score. After Indiana hit wide to put the Huskers back in front, Sweet finished the set with a kill to make it 30-28 Big Red. The set ended with nine ties and four lead changes and was the highest-scoring set the Huskers played since a 30-28 win on Nov. 4, 2015 at Purdue. Set 3: Nebraska came out with a point to prove in set three, bolting to a 5-0 lead with three kills by Sweet and two blocks by Sweet and Schwarzenbach. After Indiana got on the board, kills by Sun, Sweet and Foecke and an ace by Sun made it 10-1 Huskers. Nebraska piled on the points and clinched the match with a 25-11 win. Up Next: The Huskers begin a four-match road stretch at No. 9 Penn State on Saturday at 7 p.m. (CT). It marks the first of three straight matches against top-10 opponents on the road.